I enjoy dabbling in making digital abstract art. Recently, I added 2 different collections that I created. One is called Sivilia and the other is the Mystic Lights collection. The Sivilia collection was created by using bright colors and painting them digitally. I wanted this collection to be a digital painting in abstracts. The main theme of the design is that I'm using diagonal brush strokes and creating empty space with dark or light tones, but also trying to make an impact with color. The Mystic Lights collection was created from photographs of light and enhancing them through photo manipulation to enhance the colors and backgrounds. I've texturized the backgrounds for a more unique look of the paper. 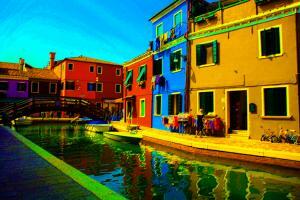 The Island of Burano in Venice, Italy is full of colorful architecture and canals. I have visited the town several times and really enjoy the brilliance and charm of the place. I decided to create a small collection called "The Colors of Burano" using a different technique than just normal digital photography. I have given this collection a digital pastel treatment and enhanced the colors. Several of the pieces of art contain the Primary Colors and others just focus on reflections in the water. 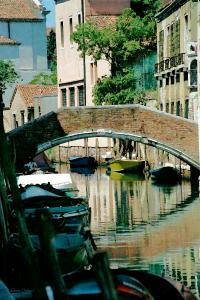 But most contain the interesting architecture that we love in Burano and Venice, Italy. Please keep in mind that these works are best viewed in a larger size on canvas to maximize the details of the pastel look. I hope that you enjoy the series. 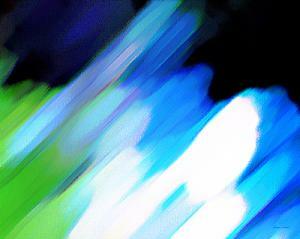 I had actually created my Digital Watercolor collection back in 2000. I created this new medium for myself and called them "Digital Watercolors". I was offering the main collection as Limited Edition Prints, but now I'm adding them to my portfolio as prints. This collection was created from my travel photos. I painted them through Photoshop to make them look more like a watercolor and had them printed on high quality watercolor paper. In fact, I still suggest that you change the paper style to be a higher quality watercolor paper before you place your order. My art was in the Thirteenth National Juried Exhibition: A Curator's Choice Winner, Viridian Artist Inc. Juried by Robert Rosenblum, Curator of the Guggenheim Museum in New York City. June 25 through July 12, 2002.